Late Iron Age settlement at Heybridge was centred on a shrine, with a series of plots to north and south. In the mid 1st century AD the settlement was remodelled with metalled roads, a new temple on the earlier sacred site and a reworking of the plots into enclosures. North of the settlement were a number of burials, pyre sites and pyre debris dumps, at least one of which may have been ‘aristocratic’, suggesting the presence of a local elite. A period of stability followed when there was little substantive change to the settlement, except that the temple precinct was remodelled. The settlement seems to have been a large village or small town with a market and a religious function. Gradual decline and contraction is evident through the 3rd and 4th centuries, yet the religious focus remained into the late 4th century, when a substantial building — possibly an early Christian chapel — was placed over the former precinct wall. High-status burial continued at Heybridge into the late 4th century, despite the apparent decline in settlement status. 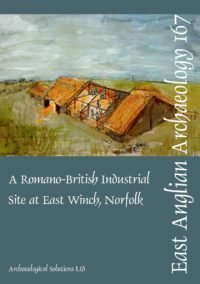 What remained of the former Roman settlement into the 5th century, and whether there was continuity of occupation into the early Saxon period, is unclear. The main focus of early Saxon settlement was on higher ground to the north-east. 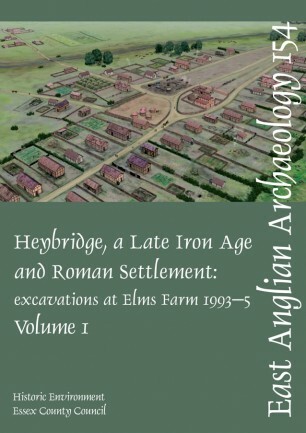 The settlement at Heybridge clearly had an importance that developed, changed in emphasis, and ultimately waned over the 500-year span of its existence. However, the authors argue that the thread of Late Iron Age social cohesion and control was not lost but maintained throughout the time that Britain was a Roman province. This monograph (Volume 1) presents synthetic discussion of the site. Volume 2, the stratigraphic descriptions, finds and environmental reports, is published in Internet Archaeology (http://intarch.ac.uk/, doi:10.11141/ia.40.1), where it can be accessed free of charge.